Pamukkale (Cotton Castle) unique in the world, ancient Roman site Hierapolis. More. Enjoy the miraculous wonders of the Cappadocia region from the sky at sunrise for 85-90 minutes of blissful splendor. Complete your memorable flight over the land of the Fairy chimneys with Champaign and a flight certificate. All our pilots are certified proffesionals who have many years experience in aviation. We offer full insurance to all of our customers. We also offer a 55-60 minute flight. Please contact us for discount price. Flights are scheduled daily (weather permitting) for sunrise (approximately 5:15 am ) and return to your hotel 8:30 am . Hotel pick-up & drop-off are included in the service. Pre-Flight: An informative pre-flight briefing by your FAA Certified Commercial Pilot. All of our pilots and balloons are fully certified by the Federal Aviation Administration. Inflation: You can actually participate in the exciting inflation process, or just watch the multi-colored balloon unfold a world of color around you. Before you realize it, the pilot stands the balloon up and you board the hand-crafted wicker basket. Takeoff: The lift-off and ascent is so gentle many people do not realize they have left the loving arms of mother earth. As you become one with the wind, you lose sensation of motion and perception of heights. You begin to feel the peacefulness and tranquillity of ballooning. Landing: Your pilot will look for a spot near a farm, where there will be thrilled people to help you celebrate your “arrival”. After landing the pilot and crew will pack up the balloon and return to the launch site for the post flight celebration. The tradition of celebrating the flight began in the early 1700's upon landing, the first balloons were feared as evil spirits, and attacked by the local villagers and farmers. A later balloonist presented a letter from the King and a bottle of champagne as evidence of their Earthly origins, and so continues today, the tradition of champagne as a gesture of friendliness and good times. Transfer: Our crew will transfer you back to your accommodation. Balloons operate through the basic principles of gravity and heat transfer. As air inside the balloon is heated, it rises. As the air inside the balloon cools, it descends. To make the balloon fly, an inflator fan fills it with air, which is then heated. What are the main parts of a hot air balloon? A hot air balloon has three major parts: the envelope, the burner, and the basket (or gondola). The basket is where passengers ride. Usually made of wicker, baskets protect the occupants and are lightweight and flexible. The burner is positioned above the passengers' heads and produces a huge flame to heat the air inside the envelope. The envelope is the colorful fabric bag that holds the hot air. When the air inside the envelope is heated, the balloon rises. To descend, the pilot allows the air to cool and the balloon becomes heavier than air. The pilot has complete control of the up-and-down movements by controlling the heat in the envelope. What are envelopes made of? Rip-stop nylon is the most common material, but polyester and other fabrics are also used. The fabric around the lower opening (called the mouth) of the balloon are usually made from a fire resistant material like Nomex, similar to the suits that firefighters wear. What is a balloon basket made of? Woven wicker is used because it is lightweight, flexible and easily repaired. It also looks nice! How long will balloons last? Depending on the care given, a balloon envelope may last 500 or more flying hours. The basket will last much longer, perhaps thousands of flight hours with proper care. Winds determine a balloon’s direction. The pilot can steer a balloon, to a limited extent, by adjusting the balloon’s altitude to make use of different wind speeds and directions. Our balloons' capacities range from a minimum of 10 to a maximum of 21 passengers. How long does a balloon flight last? This depends on the type of flight. The standard flight lasts approx. 1 hour and the deluxe flight lasts approx. 1 hour 30 min. What fuel do balloons use? Our hot air balloons carry up 80 litres of propane in stainless steel fuel tanks. How high do balloons fly? Balloons normally fly below 2000 feet, all within Federal Aviation Regulations. At these altitudes you will be able to observe people and animals as time appears to stand still for awhile. How safe is a balloon? Hot air ballooning is considered one of the safest forms of flying. Serious accidents are rare. What happens if the burner goes out? If the burner goes out, the first burner would be reignited. If that did not work, there is Fire Two that can be relied on to fly the balloon. If that fails, there is a third burner! If there were no burners, the balloon would land at about the same rate as a parachute. What happens if a bird flies into a balloon? Balloons are so large that most birds avoid them. The envelope fabric is much tougher than it might appear and a bird would likely bounce off if there were a collision! Balloon manufacturers have performed tests, and it is possible to fly a balloon with a hole large enough for a man to go through as long as the hole is not at the top of the envelope. How long does it take to inflate and deflate the balloon? Our ground crew can inflate and launch a balloon in fifteen minutes or less. It takes about the same amount of time to deflate and pack up the balloon after the flight. Do you need a pilot's license? Yes. All our pilots have official licenses from the Turkish Civil Aviation and international civil aviation authorities. Why do we fly in the early morning? We fly during the first few hours after sunrise because this is the calmest, coolest part of the day. This allows for soft landings and maximum lifting capacity of the balloon. In addition, there is the splendor of a beautiful sunrise. The whole experience lasts 3 to 4 hours, so you will have the rest of the day to enjoy the many attractions of Cappadocia. What do I wear and bring? Depends on the season. We fly in the winter too! Although we usually land close to a road, you may be walking through fields. It is no colder in the balloon than on the ground, yet you may wish to bring a light jacket. Layered clothing is best. Bring your camera and lots of film. Our crew will be happy to take pictures of you in the balloon. How passengers stay in basket? Passengers normally stand in the basket during the flight. But don't worry, the basket is chest high! We go where the wind takes us. 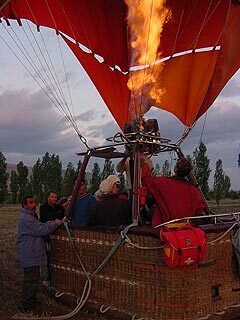 The sky is layered with air currents, so the pilot heats the air inside the balloon with the burner to rise into currents with different directions. We are welcome to land in the many open fields in the area we fly over. Your pilot will begin the gentle descent when he finds an appropriate landing site where we are met by our experienced ground crew. Before we fly, we check the wind speed. Generally, we fly when there are wind speeds of less than 10 miles per hour. Our flight is not recommended for children under 10 or adults approaching 80. Once aloft you will notice no turbulence or wind movement as you become one with the air currents. Much more subtle than an elevator ride, the feeling is one of peace as you drift over treetops and float over the countryside in gentle, panoramic harmony with nature. Some passengers describe the feeling as "romantic" while others tell us it's "gentle and calm." Yes. All passengers are insured up to 1,000,000 EURO by the world-wide insurance company, Allianz, in Turkey. What is the difference between a Deluxe Tour and a Standard Tour? Our deluxe tour offers a comfortable and intimate setting in which to enjoy the fairy chimneys. The balloons used for the deluxe tours hold bet ween 10 to 12 passengers giving you more room to enjoy your flight. This flight lasts approximately 1 hour 30 min. ensuring that you see all this incredible area has to offer. Our standard tour uses our larger balloons. This means your flight will have any where from 16 to 21passengers. This flight lasts approximately 1 hour. Although shorter than our Deluxe Tour, the standard tour still offers you enough time to see the unique beauty of this area. How can I make reservation? You can send an e-mail to for a reservation or you can complete our online booking form. We pick you up from your hotel. You will have a light breakfast before departure. At the end of the flight you will celebrate with a glass of original Goreme Balloons champagne, awarded your flight certificate. We can help you celebrate birthdays, anniversaries, or any other special occassion. Flight Rates Goreme Balloons offers you 2 types of balloon tours. The pick up and drop off times are subject to change depending on seasonal and climatic conditions. We look forward to taking you to the skies of Cappadocia. We pick you up from your hotel/hostel with our luxury vehicles (Mercedes Sprinter or Vito) and take you our launch site in the early morning. While you have your open buffet breakfast which includes coffee/tea and snacks,we prepare the balloons on the ground. You will have an opportunity to watch. The preparations take just 15min. At around sunrise,our balloons begin to take off. 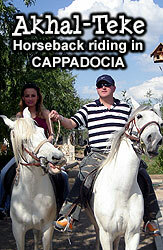 They rise approximately 1000 feet to show you sunrise and extraordinary views of Cappadocia. -Then they descend and float through the valleys,between fairy chimneys and caves which gives you excellent views to take pictures or videotape. The Deluxe tour uses a smaller 10-12 person capacity balloons. This deluxe tour is great for those seeking a more comfortable, intimate setting for their experience of a lifetime. Upon landing, we have a champagne toast service for you. All our passengers are insured up to 1.000.000 EUR by Allianz. At about 8 am,our minibuses will take you back to your hotel/hostel. Your entire balloon adventure lasts about 3 hours. Then they descend and float through the valleys,between fairy chimneys and caves which gives you excellent views to take pictures or videotape. The Standard tour uses a 16-21 person capacity balloons. This is a great option for those travelling on a budget. Upon landing,we have a champagne toast service for you. At about 7 am,our minibuses will take you back to your hotel/hostel. Your entire balloon adventure lasts about 2 hours. 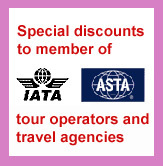 The price of this tour is 160 Euro (vat included) per person.